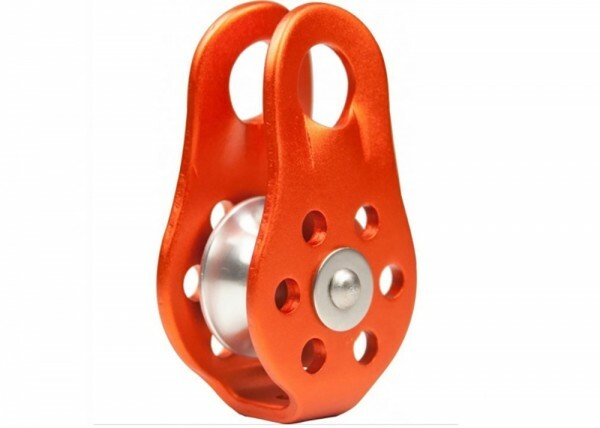 For smooth mobility along the track, the Mini Pulley is versatile, lightweight, compact and strong. Stamped aluminum sideplate, aluminum sheave, oilite bushing, riveted axle. Accommodates our 7mm lines. Available in orange or black; choose below. Place the pulley anywhere along the line by clipping it in with the carabiner. No need to thread it into the line. Place the pulley in between two rope clamps, which will function as bumpers, both protecting the pulley from the metal ratchets as well as restricting movement of the pulley.